SUCCESS-we crave it, work for it, dream of it, want it as a personal achievement, but how we each define it differs. Power, influence, wealth, fame, or a position of authority - the hallmarks of success we strive for - can just as easily become the cause of our destruction, if we don t have a clear set of boundaries by which to live. Corporate and religious scandals of recent years have caused unprecedented havoc and heartache in the world's economy and in the church world. Executive and spiritual arrogance causes a toxic atmosphere in too many organizations. There are safeguards and principles we must focus on to ensure balance with excellence in what we do. Core questions to be considered include: Should you fear success? Why do so many fail when they attain success? Is failure considered a friend or foe? Do you have a balanced ego or a pre-occupation with self? 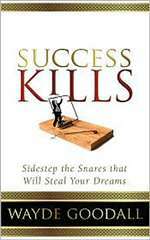 Take a discerning look at the concept of success in a personal, professional, and spiritual context in Success Kills. Explore the gift of adversity, finding a moral "north", learning from mistakes, and why some fear "successful" leaders. Discover a more important definition of success and the principles you can put in place today to achieve without compromising yourself or your future.